My baby girl (now 7 months) has been diagnosed with epilepsy at the age of 5 months. She is currently on sodium vaporate and clomozapame. It seems to control her jerking seizure quite OK but at times we notice that she still has some form of complex partial seizures.. In addition to this, we strongly believe she has neurofibromtosis due to her cafe olio spots on her body and also I believe she inherited the spots from me. Anyone can help with the above mentioned? I’m tagging @irvkay312 @kevinkelley @sarahv to bring them into this conversation. Kay and Kevin have lived most of their lives with epilepsy and Sarah has a young son with epilepsy. 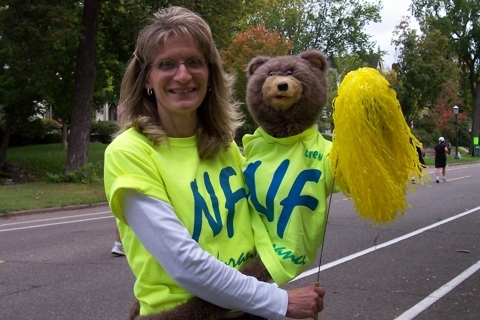 @pkglitter has a grandchild with NF1 and @nfrunner work in NF advocacy. By tagging them on this conversation, I hope they will return to Connect to share experiences and information with you. Jon, have you spoken to you daughter’s doctor about your suspicions of neurofibromatosis? Hello, as a person with a form of NF, I agree that café au lait spots are considered the first and most common indication of NF. I think the criteria says 7 or more spots. Since you both have spots, that would be something to definitely talk and show to your doctor. NF can be inherited (50%) or spontaneous. I belong to a Facebook group called NF Mom’s Rock and I recall posts about NF and epilepsy – others asking the same question as yours – is NF and epilepsy related? I don’t know the answer but genetics could help you with that, too. I understand and share the feeling that NF alone is enough. While they talked of their children with NF and epilepsy, I don’t recall anyone citing any confirmed medical conclusion. I am glad to read that there is help for her seizures, little doll. Thanks so much for the reply. Regards the nf1. Just these weeks, we have notice a few form of minor and subtle seizures. 2) will she grow out of it? 3) as nf1 is a progressive disorder, is this linked with her epilepsy? diagnosis “to Woods lamp), from that point we knew what was. growths came back, which told me it was Tuberous Sclerosis. bone–such as Phentoin and Dilantin. What type of epilepsy does your daughter have? started if with atonic seizures, with jerking of the arms (generalized).